and environmental concerns associated with regular softener salt. Although KCl costs more than conventional softener salt–a lot more in some areas–use of potassium is increasing. A number of questions arise when softener users considered switching to potassium. The informal FAQ below, based on information from William Wist et al., Water Softening with Potassium Chloride, answers most of these. 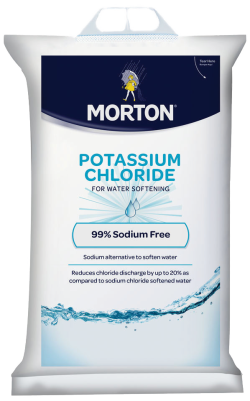 Do you need a special water softener if you plan to use potassium chloride? No, any standard water softener will run on either salt or potassium. Are changes in equipment needed if you switch from NaCl to KCl? For normal salt settings, no change is needed. For extremely low salt doses (e. g., 4 lbs. of salt per cubic foot of resin), however, a slight increase might be needed. Four lbs. to 4.5 lbs., for example. Can potassium chloride be added to a tank that already has salt in it? Yes, there’s no incompatibility issue if you mix the two. Can a softener running on KCl be used to remove iron and manganese from well water? Yes, in reasonable amounts, just like salt. Does KCl soften water as effectively as NaCl? Are there any negative health issues associated with drinking water that has been softened with potassium chloride? No, except for with a small number of people who are at risk of potassium overload. Can KCl be used to water house plants? Yes. Keep in mind that, as with any water, excess water should be allowed to drain from the bottom of the pot. Can you put KCl-softened water in a fish tank? Not a good idea. No softened water is recommended for use with fish. How about dogs and cats? Yes, its good for them. How about lawn and garden? No problem. In fact, potassium is a plant nutrient. However, avoid giving your plants too much of a good thing. It’s best to alternate between watering with hard and softened water to provide a balance of nutrients.